I got tired of seeing my 40-year-old photo in front of my C-150, and promised to post a new Avatar of another of my Tail-Draggers, so here is my old 1946 Ercoupe 415C/D. Yes, that is the parking wheel on the nose! Ed, can you share a larger photo of both of these? Why - are you planting a garden and want to scare the varmints away? Here's one - will have to look for the ugly one of me. This one was taken when I first bought the plane - later sold it with Cleveland wheels and double-fork nosegear, dark bronze sunroof and light bronze windows. How did you like flying it. I always thought they would be fun. There is a female at SMD who, I was told, has no arms. I have no idea what the reason is. She flys a Ercoupe. I've wondered if it originally had pedals that were rigged to the alerions. Flying the 'Coupe is like forgetting everything you know about landings, takeoffs, and taxiing - You just DRIVE it. Scared hell out of me first x-wind landing - Book says to hold the wheel LIGHTLY with two fingers, or just let go of it - I held it with a tight fist, and it darn near broke my arm when the nose wheel touched. Other than that, I really enjoyed it when I got used to crossing my legs and relaxing while landing in a crab - it never failed to straighten out on its own. A friend of mine had hit the guywires on a tower when he was flying, and was paralyzed from the waist down - he flew a Coupe with a hand brake on the IP. I flew a rented one that way once for my BFR. The Coupe only has one main brake for both wheels. One early mis-conception got some folks hurt or killed - the word was that the Coupe did not spin - Somehow, this got confused with, "The Coupe will not Stall" - This was totally false, THEY WILL STALL, and caused some wrecks at landing time. If you take your pilots test in the Ercoupe, you have a restriction on it, and cannot fly 3-control planes until you take another test - sort of like taildraggers endorsement. I had already been thru commercial training in Cessnas when I got the Coupe. There is a female at SMD who, I was told, has no arms. I have no idea what the reason is. She flys a Ercoupe. Her name is Jessica Cox, an incredible woman. She has an amazing story. I've heard her speak and she flew a friend of mine's Erocoupe. I saw the video of her some time ago - WAY TO GO GIRL! 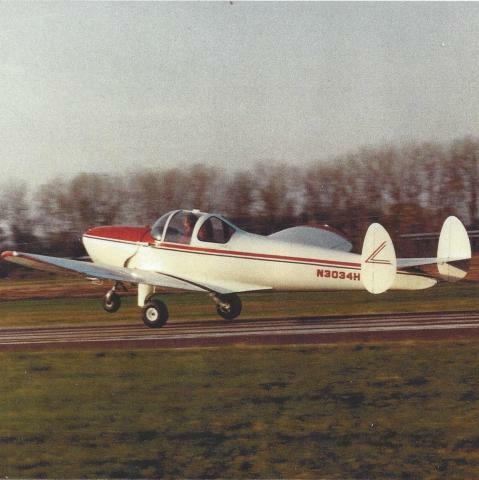 I thought seriously about building an AB-Experimental Coupe with a conventional tail and 3 way controls years ago - Someone built a single-place, but I wanted 2 seats - Of course, it would be a taildragger, with the parking wheel in front! Then I got Kitfox fever, and haven't recovered! Perhaps I was misinformed about her flying at SMD? it is contagious... it seems quite fatal to wallets and marriages as well. My wallet is mostly empty and my wife passed in '12. Guess I'm safe. And before it starts, that is 2012 NOT 1912! Watch out Ed. That was post #100!! Glad that more people are writing - didn't think my Ercoupe avatar would make so much conversation - but I am glad it did. I plan to get more work done on Foxy and less writing this year - If I can ever find a stopping place! typical weather in the Tornado Alley area. May is usually the worst month.